I’ll bet you quickly came up with this answer- “WINE!” That’s certainly a correct response, so you earn points! In fact go pour yourself a glass! However, did you know there’s another delicious grape “juice” that is often more expensive than wine, and takes just as much time and delicate care to create? We are talking about that luscious dark brown syrup you’ve probably seen served on some fresh salads. You got it. Balsamic Vinegar. The majority of the finest Balsamic Vinegars come from only a couple of places in the entire world, take more than a dozen years to age for the best flavor and have to pass stringent taste testing from a panel of experts with very refined palates. First off, a little history. There is a bit of controversy about the beginnings of Balsamic Vinegar. Some say wealthy families in the small towns of Modena and Reggio just west of Bologna in the northern Italian region of Emilia-Romanga had been making Balsamic Vinegar for themselves for centuries. Families would nurture their supplies over the years, passing it on from generation to generation, gifting small amounts to esteemed friends and honored guests and even bequeathing some to a daughter as part of her dowry. Others suggest Balsamic first showed up in 1046AD. Henry III of the Holy Roman Empire was presented a silver bottle of this tangy condiment on the way to his coronation while passing through the Emilia-Romagna Region of Italy. Never mind its start, the process of making Balsamic Vinegar has remained largely unchanged. 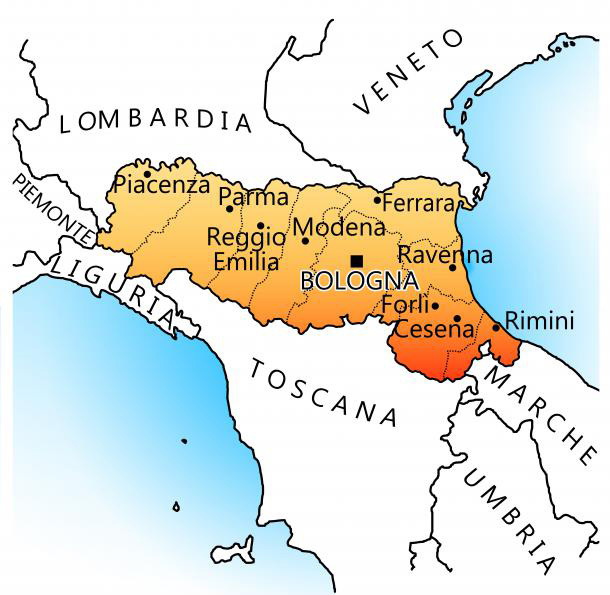 One point that’s agreed upon is that the Emilia-Romagna region and neighboring Modena are still the only locales where Traditional Balsamic Vinegar is painstakingly produced. So why all the fuss about balsamic vinegar? Well let’s start off with some facts about Balsamic Vinegar. The word “Vinegar” is rooted in the Latin “vinum” meaning wine, and “acer” meaning sour. “Sour grapes” might sum it up, but it surely doesn’t do our friend in the little bottle justice. 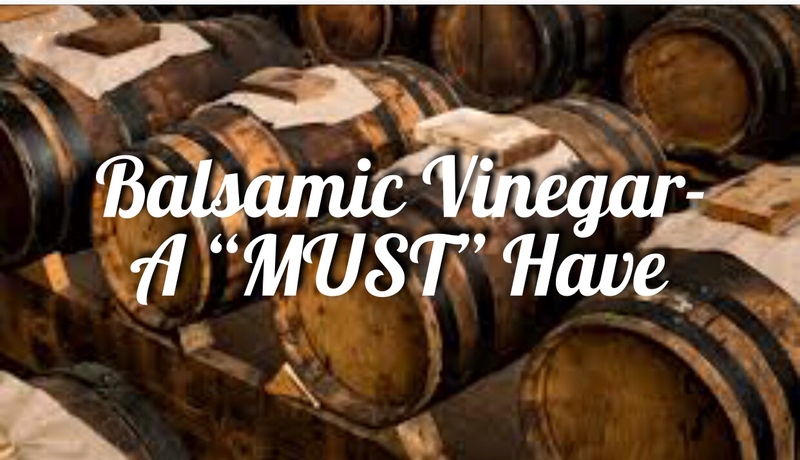 Contrary to what you might think- there is no balsam in Balsamic Vinegar. Instead it’s from the Latin word “Balsamum,” which refers to a substance that soothes, relieves or heals. 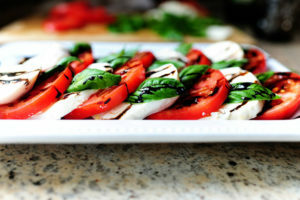 Indeed, Balsamic Vinegar DOES have many health benefits, which we will detail in a moment. It all starts with grapes. Not just any grapes either. Generally it’s only Trebbiano grapes and sometimes the Lambrusco variety that have the proper sweetness to become Balsamic Vinegar. At the beginning of their LONG journey, these late-season harvested grapes are pressed-stems, seeds, skin and all, into what’s known as a “must.” The “must” is boiled down to a minimum sugar content around 30%. The syrup is then placed into large kegs along with a “Vinegar Mother” to start the aging process. We’re not talking about days or weeks here, either. Years. Sometimes up to a century will go by as the vinegar is progressively transplanted into smaller barrels-often made of different woods such as chestnut, cherry, ash, mulberry, oak and juniper-to further concentrate and add to the distinctive taste. A high quality Balsamic Vinegar will look glossy. It should be very viscous, meaning it pours out REALLY SLOWLY. It will have a rich, dark brown color. There will be complex notes of sweetness suggestive of figs, cherries, molasses, chocolate and prunes among others. You should also pick up some of the wood aroma from the various barrels it aged in for all of those years. Good Balsamics will have an almost smoky quality as well, and will never be harshly acidic. Now let’s go back to that word “balsamum,” referring to health benefits. Several studies show that Balsamic Vinegar can promote heart health and reduce high blood pressure by reducing triglycerides and total cholesterol in the body. Anti-oxidants found in Balsamic Vinegar destroy free radicals, which lead to cell damage. Polyphenols in Balsamic Vinegar stimulate pepsin enzymes in our body, which can strengthen the immune system to fight diseases like cancer and reduce inflammation. There are many other benefits suggested by some research ranging from improving skin health to promoting healthy digestion. 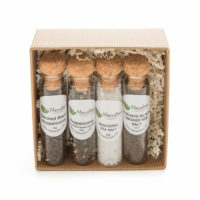 At Marvalhas you’ll find two wonderful Balsamic Vinegars. The first is the MiaBella. This is a Traditional Balsamic Vinegar from Modena, Italy. 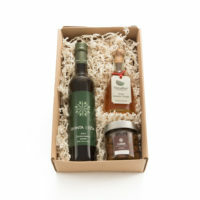 Our second option is the Marvalhas White Balsamic Vinegar. This is made from white Trebbiano, with a touch of Lambrusco grapes. Care is taken to prevent caramelizing, which preserves a golden color while maintaining the unique sweet and sour taste you expect in Balsamic Vinegar. So now that we know it’s good tasting, good for our health, and where to obtain the best Balsamic, how do we use Balsamic Vinegar? Let’s start with a “don’t.” Balsamic is not intended for cooking. Heat will absolutely destroy its distinctive taste and aroma. Traditional Balsamic would also be wasted as a salad dressing. Instead, give it a place where it can stand out. A few drops on fresh berries, panna cotta, vanilla ice cream, or even on a piece of Parmigiano-Reggiano cheese will be a perfect compliment. Drizzle it on cooked scaloppini, risotto, or on top of grilled meats or seafood. With a White Balsamic, versatility rules. 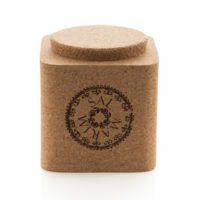 Its honey-like quality will heighten the sweetness of grilled stone fruits like peaches and plums, paired with ice cream. Drizzle on carrots or even roasted beets. White Balsamic used on kale or spinach will tamp down the bitterness. 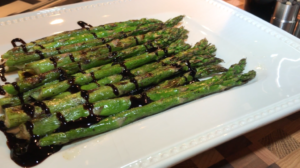 No matter how you use it, you won’t need much to make a bold statement with Balsamic Vinegar!